Rio Olympics bronze medalist Sakshi Malik on Friday registered an emphatic victory against her opponent Pooja Dhanda but could not save her team Delhi Sultans from losing in the Pro Wrestling League 2 in New Delhi. Jaipur Ninjas, Pro Wrestling League's new entrant, continued their brilliant run in the second edition of the tournament to notch a 4-3 win over the local favourites. 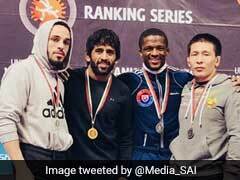 From Jaipur, the Georgian duo of Elizbar Odikadze and Jakob Makarashvili, Olympic medallist Jenny Fransson and emerging Indian wrestler Vinod Kumar Omprakash won to take an unassailable 4-1 lead after five bouts out of a total seven in the second season of the Wrestling league. The crowd had gathered in numbers to see the bout of their favourite wrestler Sakshi Malik. Sakshi showed her mettle with an 8-0 lead over another Indian Pooja Dhanda after the first round itself in women's 58kg weight division. Starting off with a point, she studied her rival Pooja Dhanda carefully before pinning her down and flipping her over to take a huge opening round lead. Having taken the mat for the first time after the Rio Games, Sakshi never looked as if she was away from the arena for so long, as the 24-year-old kept increasing the points in the second round as well and won it 16-0 via technical superiority in 5 minutes and 32 seconds. 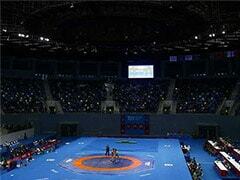 The 2014 senior Asian bronze medallist Pooja proved to be a cropper against her much superior Indian colleague.